Long Beach police are looking for an older model white Dodge Charger involved in a hit-and-run last month that left a Buena Park man dead, authorities said. 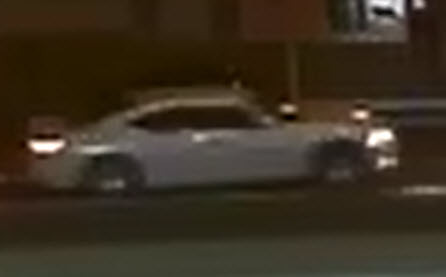 The Long Beach Police Department (LBPD) released a photo Tuesday of the suspect vehicle involved in a traffic collision on Monday, April 25. The car is described as a 2005 to 2009 white Dodge Charger. The suspect driver remains outstanding as well. Officers were originally called to an attempted suicide call near East 7th Street and Redondo Avenue at about 1:17AM, an earlier release stated. The man—identified as 27-year-old William Mendoza of Buena Park—was found not breathing by officers, near East 7th Street and Loma Avenue. He was determined dead at the scene. According to a preliminary investigation Mendoza was in the roadway, outside of a crosswalk, when he was struck by a white four-door sedan. Anyone with information regarding this incident is asked to call the Long Beach Police Department (LBPD) Collision Investigation Detail at 562.570.7355. Above, left photo courtesy of the LBPD.